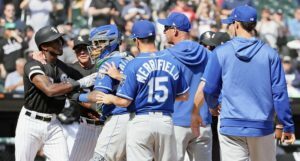 On Sunday afternoon, Anthony Rizzo stepped up to the plate with two outs in the top of the eighth inning, before grounding out to Pirates second baseman Sean Rodriguez in his final at-bat of the day. 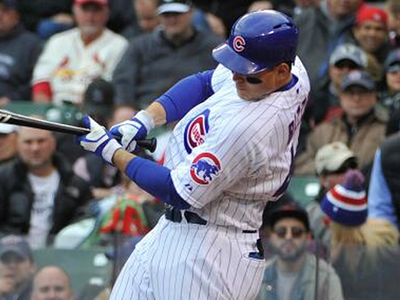 Despite the seemingly ho-hum finale, Rizzo went out with a bang in the first half – notching eight hits in his final nine plate appearances, including four(!) doubles and a triple. The blistering hot ending was just the frosting atop a brilliant first half Rizzo cake – a first half that got him elected to his third consecutive All-Star game by age 26. And while there were a lot of All-Stars (seven to be exact) on the Cubs this season, Rizzo seems to stand out above the rest. He is the unofficial leader of the team, one of the most likable Cubs in recent memory, a frequent philanthropist, and, oh yeah, a freakin excellent hitter. Rizzo didn’t cheat anyone in those first four at bats, either. He began his streak with a hustle-triple, and followed it up with a double, just about the longest/hardest-hit single I’ve ever seen, and another double that just missed as a home run. 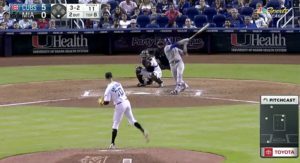 As Len Kasper mentions in the video, Rizzo began the month of June batting just .236 and finished the first half right under .300 (.299 AVG). Let’s look closer at that stretch to see just how good he was. From June 1 – July 10 (153 PAs), Anthony Rizzo slashed .385/.471/.731, which is good for a ridiculous .493 wOBA and 214 wRC+. During that stint, he crushed 10 homers, 1 triple and 13 doubles, while walking 11.8% of the time and striking out just 17.6% (that all adds up to a .346 ISO). Already one of the best hitters in the game, Rizzo was especially dominant during that (not-so-short) stretch of 150+ plate appearances. Let’s see what his total season numbers look like, then, and how they stack up against the other qualified hitters throughout the league. No matter how you slice it, Rizzo is one of the top ten hitters in baseball and likely just outside of the top five, overall, depending on what you value. Zoom it down to just the National League, though, and there’s no question he’s among the very best. 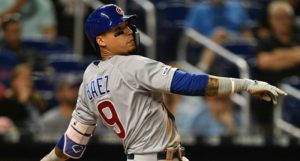 Along with Kris Bryant, the Cubs may genuinely have two MVP candidates battling it out on the North Side of Chicago for the rest of the summer. And tomorrow, it all kicks off again, as the Cubs’ second half gets underway. We’ll see if Rizzo can keep up his ridiculously hot streak.